Well recently I have taken interest again and started meddling with my Mendel. The first outstanding task was to solder the voltage reg and capacitor to the motherboard. 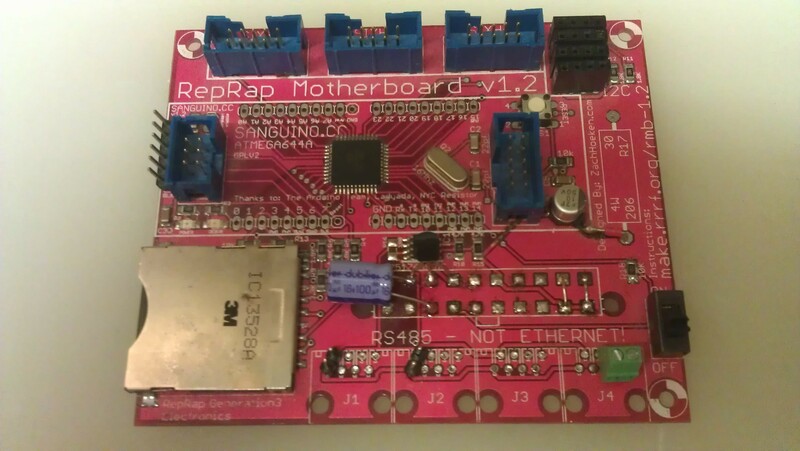 I didn’t much like the official reprap solution of powering the motherboard entirely via the usb port! so rather than add a jump wire between the comms port and the 5v track I instead used a spare track to connect a power connector at J4. This still leaves J1 J2 and J3 to be used for additional extruder’s. The motherboard will be powered instead from my previously hacked ATX power supply which will provide 0v 5v and 12v via the XLR connections. For some reason the official reprap uses these 3 wire connectors as well but doesn’t utilise the third wire. 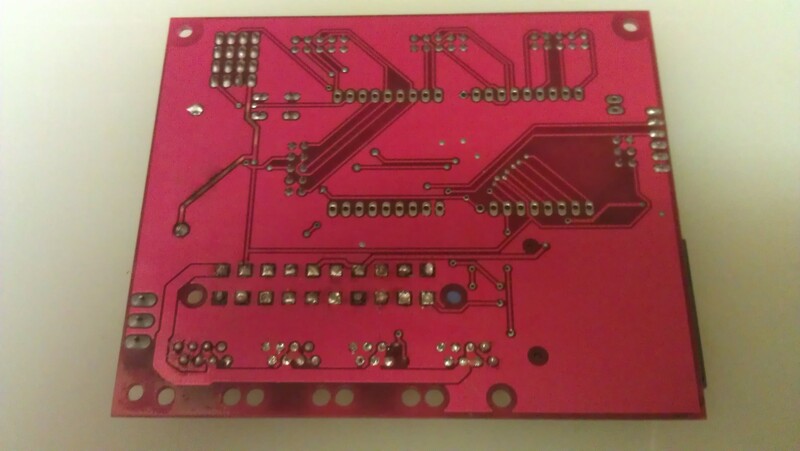 I haven’t been able to work on RapCAD for a few months as I have been busy with other activities. I have however been contacted by a few people who are still interested in the project. I have even had one person willing to help out with the coding, so I would like to take the opportunity to welcome Steve Kelly aboard the dev team. RapCAD builds are becoming a bit tedious so I am trying to streamline the process by setting up a build server that hopefully will automagically build for Windows, Mac, and Linux. Because of this, I have not done much development on RapCAD this month just a few bug fixes. 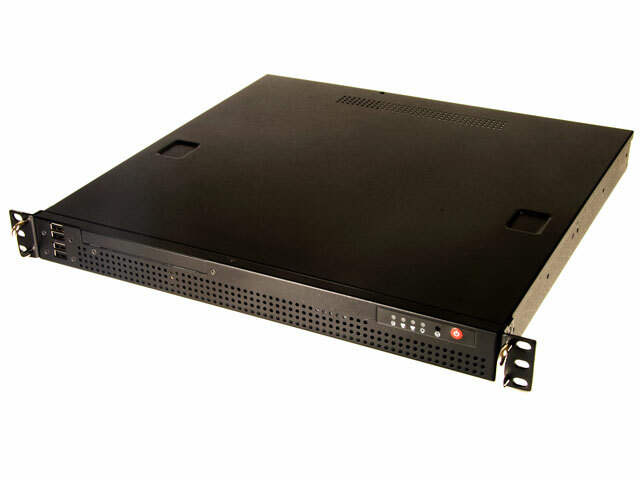 The build server is a small mini-itx based rackmount server that stays on permanently and runs a few other daemons and cron jobs. It has quite a nice hard disk layout with the main readonly partition being on a flash drive and the /home on a large RAID array. /tmp and swap are on partitions of the disks that do not form part of the array. The server runs some VirtualBox VMs that do the build processes for the various platforms. Version 0.6.0 is available this month. See the Download Page for details. Revisited – make a DVD out of just about any video file. I recently was asked to create a DVD from a .mov video file. I had already made a post about how to do this under windows using windows ports of various linux based applications. Coming back to it and this time running completely on linux, I have realised that it can be done much more simply. First off the video file has to be transcoded into an dvd compatible mpeg2 file. Then the file has to be authored into the correct VOB files using dvdauthor. To make sure that there are no errors in the process the following environment variable must be set. Rather than using an xml control file for simple DVD’s the following two dvdauthor commands will suffice. Posted on October 25, 2011 March 1, 2013 Categories ComputersLeave a comment on Revisited – make a DVD out of just about any video file. I have been starting to think about how to integrate the controls for my Reprap Mendel into RapCAD. I was inspired by Kliments pronterface console which as well as being colorful also looks very intuitive and clutter free. 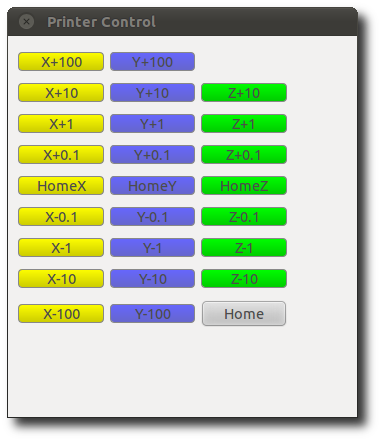 So far all I have done is added a simple prototype GUI interface which can be accessed via the print button from the RapCAD main toolbar. This will allow basic integration and testing with the libreprap library. Ideally of course I also need to finish off the remaining electronics on my Reprap Mendel so that the integration can be tested properly. So in many ways I want the features that I am developing now to motivate me to finish of my Mendel, which after an initial bout of progress has been sitting on the shelf and collecting dust for a year. The reason it has been so long is that I got distracted writing RapCAD. For some reason I thought that I would have enough time to spend on both projects, but as always I am going to have to manage my spare time more carefully. Version 0.5.0 is available this month. See the Download Page for details.